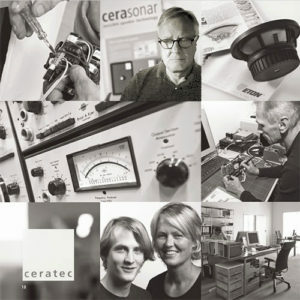 The creative and intellectual mainspring of cerasonar are Constantin, Julius and Ulrich Ranke. And it’s Ulrike Ranke’s passion to innovate which led to the birth of cerasonar, again one achievement that blends in the family tradition. As founder of the legendary hifi experts eton, Ulrich Ranke succeeded to revolutionize the market time and again since the 1980s, including the invention of the patented, ultra-light honeycomb hexacone® membrane. Maintaining the tradition, cerasonar heralds a similar paradigm shift in terms of invisible speakers. Errors excepted, technical changes reserved.